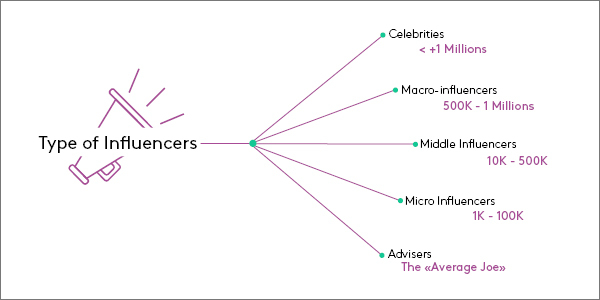 First off, some of you may be wondering, what is a micro-influencer? Unlike how celebrities or traditional (macro-influencers) use social media, micro-influencers are typically those who specialize in a certain vertical of content creation or even industry and share social media posts about these core interests. Micro-influencers have a more modest number of followers (in the thousands to tens of thousands) who are loyal, hyper-engaged and therefore generate higher engagement rates than traditional influencers with higher numbers of followers. What’re the benefits of partnering with micro-influencers? These individuals are trusted by their followers because their content is highly focused. Their followers have a genuine interest in the content of this micro-influencer development. 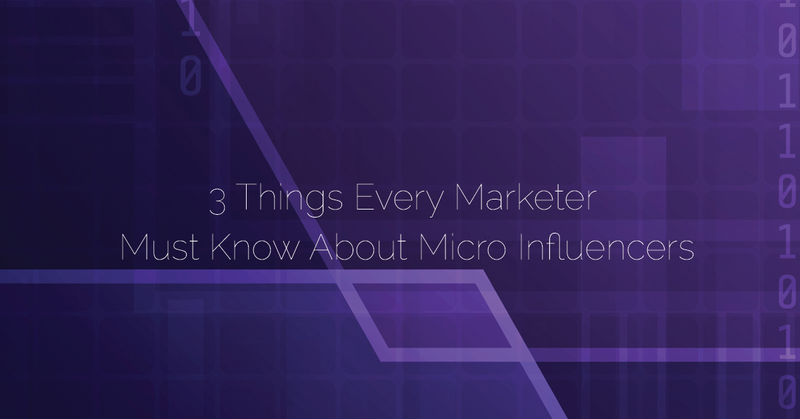 Micro-influencers are brand relevant, and likely focus on a few brands, products, or ideologies that their followers believe in as well, which in turn creates and reinforces positive and loyal relationship. This isn’t the same for celebrity influencers where their audience may have a general interest or idealize their personas, however, can see that the brands they are promoting may not align with their core interests. Do the Kardashian actually love and use the brands they share with their followers or are they promoting them because of the price tag associated with them? Pro Tip // Creating long-term partnerships with micro-influencers instead of one-off (one time) campaigns can be very lucrative for both brand and influencer. When an influencer’s followers see repeat content about one brand or product it’ll reinforce the influencer’s brand loyalty and provide followers with purchase confidence. For brands, long-term relationships ease the busy work of continual outreach and negotiations while working with an individual of great value that truly understands the brand core goals. Simply stated, micro-influencers are more affordable. One post from a celebrity or mega influencer could cost a brand well over $500,000. On average, the cost for a micro-influencer to create a single post is roughly $250. Meaning with a small marketing budget of $25,000, a brand has the potential of partnering with 100 micro-influencers. Pro Tip // Be careful, budgets can be spent in a blink of an eye. Just because you’re reaching out to micro-influencers doesn’t mean you in for a “deal”. Each micro-influencer is running their own business and could have a preset price list. This is why reaching out the right influencers is essential so you don’t blow your time or budget on those that aren’t best suited for the campaign. Make sure to review an influencers previous partnerships, scan their followers (would they like your product), analyze engagement rate, and make sure their brand voice and content is well suited for the type of campaign your planning. If you select a micro-influencer that already expresses interest in products that align with your brand, they might be willing to provide a discounted rate as it’s equally as beneficial to them and their audience. For many marketers, determining the ROI of influencer marketing campaign is one of the biggest challenges. However, those that understand brand awareness and brand engagement are two of the most lucrative returns on influencer investment should see micro-influencer as a gold mine. Social posts created by micro influencers drive 60% higher engagement than macro influencers and are estimated to be 6.7X more cost-efficient per engagement. 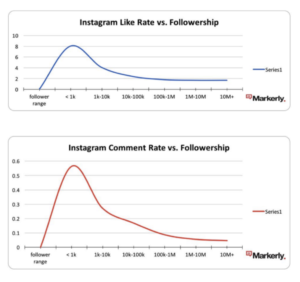 Markerly put together two great charts (see below), which indicates that engagement decreases when followership increases. Pro Tip // When vetting and selecting micro-influencers there are a few simple ways to avoid partnering with those that may have an abundance of fake followers. Look at their engagement rate. To calculate an influencer’s engagement rate, total the engagements (likes + comments + video views etc) across all of the influencers posts on a particular profile (e.g. 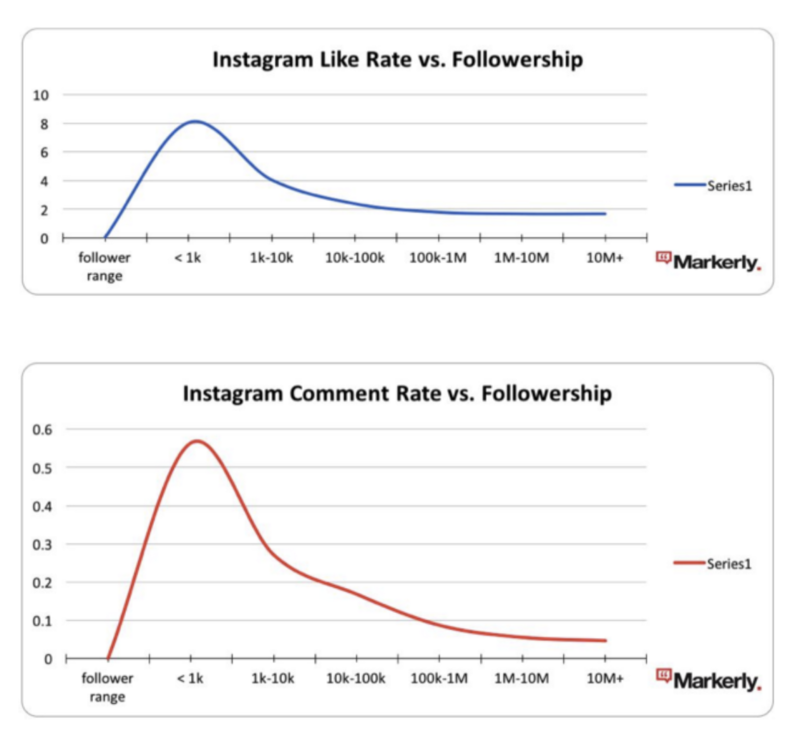 Instagram profile) then divide by the total number of followers and divide that by the number of posts (to get the average engagement per post average). Use impressions to gauge real followers. Ask influencers to share screenshots of their impression and reach metrics. Impression and reach numbers will give you a clear understanding of how many users are actually seeing the shared content. Fake following accounts usually aren’t active account users. You no longer have to go big or go home. Whether you should be working with mega influencers or micro influencers comes down to the goal of the campaign and overall budget. Nonetheless, testing out a micro-influencer campaign is highly recommended, especially for those brands that are just starting out in the world of influencer marketing. Even if you only have a budget of $1000, a micro-influencer campaign could get your brand in front of the right people that might take your brand to the next level. New York · Los Angeles · Toronto · hello@influencerstrategies.com · .